Fairlady #1 is out 4/10/2019. 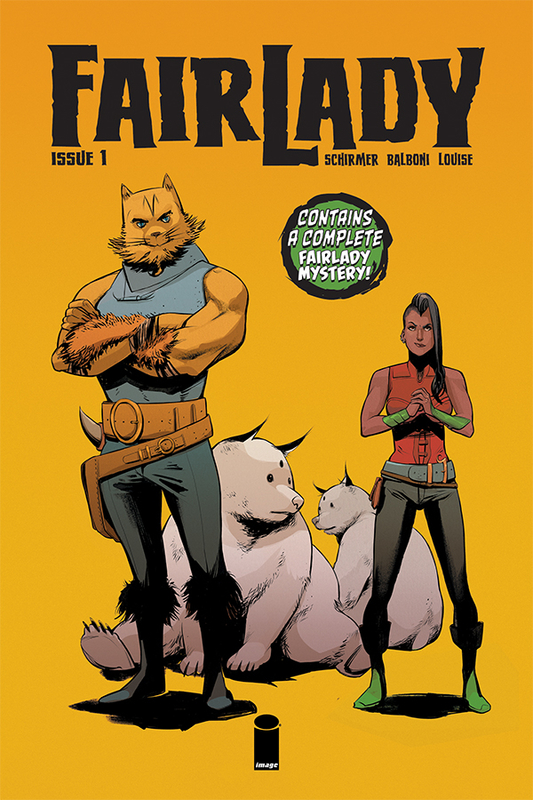 By Zack Quaintance — Fairlady #1 is essentially a hardboiled noir PI story, transposed over a high fantasy setting, with a female lead and a giant cat bodyguard too. This new Image book is written by Brian Schirmer, drawn by Claudia Balboni, colored by Marissa Louise, and lettered by David Bowman, and in terms of its plot, it’s a fairly straightforward affair. Our hero is one of many ex-soldiers in a world that no longer needs armies, one of many that have essentially become PIs. What mostly sets her apart is that she’s a woman. In this first issue, we see our hero looking for a character (a MacGuffin, really) who is delinquent on at least two major debts (that we know about). With a subject that owes this money, our hero is not the only one in pursuit. Plot complications arise around that. It’s a story that could have been set any number of places, from modern day New York City to 100 years ago in Los Angeles to anywhere in between. This is really the sort of comic where the story plays things safe and allows the art to shine. It’s a wise choice, given that Balboni and Louise create visuals that are absolutely stellar. That’s not to say the plot is lacking—it’s actually really difficult to write something as polished as it is familiar and easy to understand—but just that the visuals are what really pulled me into this world and this story. What I liked most about the art in this issue was the way it accomplished so much world-building in ways that were not overt. A village built in the ruins of some kind of mech, a character casual floating in a meditative state, a gigantic cat that walks among people, a montage that quickly shows flashes of a half dozen fantasy locales. You’ll find all of these things in Fairlady #1 without any of them being explicitly explained or dwelled upon. Schirmer’s script takes a dual leap of faith here, trusting the visual artists to deliver and the readers to connect a few dots. It works really well toward quickly establishing a captivating visual tone for this comic. This is in the end a really well-structured and satisfying debut comic. It tells a compressed and full, largely contained story, a rarity for modern #1s that I find refreshing when we get it. It also seeds plenty of thematic ground to be unpacked in coming issues, from PTSD matters related to the war to the worth of individuals in the eyes of society. Although the plot is straightforward and the artwork lush, this is still a fairly complex read that demands attention, one I highly recommend. My only qualm is that cover for some reason homages Frank Quitely’s from Batman and Robin #1, an odd choice for such a smart and original series. But it’s a small qualm.